Is it just me or are all Japanese manga cartoons just that little too deep. I�ve always found that the less you have to think about a movie the more you will enjoy it. Unfortunately for Rah Xephon it seems that the story gets away from the plot purely to confuse you. Maybe it�s just stupid me but when the story just starts to make some sense, all of a sudden the city gets turned upside down only to find another world with different rules and alliances just outside the gates. I just can�t see the enjoyment of confusing the hell out of your audience. The story follows a young boy who only knows the city of Tokyo, as far as the residents of the large city are convinced the rest of the word has been destroyed by a horrible disaster that only the superior intelligence and defenses� of Tokyo could withstand. So with the destruction of the world and only one city remaining they must endure and e mans only hope. What they don�t know is that the world is alive and well but at some point Tokyo was invaded by a great evil that has taken control of the city and put up a tremendous force field that has also created a huge creator around the shield to make the city walls almost unreachable, the residents don�t know that They are the enemy. Inside the great force field resides a normal working city with many humans going about their usual lives, but on one faithful day several air craft break through the barrier and wage war on the city of innocents. But the cities defenses aren�t as defenseless as the inhabitants believe there are two huge warriors that can take down the air craft in a matter of minutes, and to the surprise of the commanders of Tokyo the greatest weapon that they have been waiting to awake gets stolen by the very boy that they were grooming to control it for them. When our young hero becomes entrapped in the hands of the allies he is suspected of being the enemy, but when the battle cruiser comes under brutal attack by one of the enemies super subs he mysteriously finds a way out of his impenetrable cell and pilots the most powerful machine, creature thingy known to Earth. He takes control of the Rah Xephon (machine thingy) and decimates the sub with untold power, precision and ease, only proving that the Rah Xephon is now on the side of good, they have just gained a very powerful ally. I found that the episode lacked chapters, with a chapter for the start, a chapter for the middle, and a chapter for the end credits it seems a little disappointing. If I had to do something then the ability for me to find where I was up to would be very hard. If you hadn�t reached that half way point you would have no idea how close you were to it. 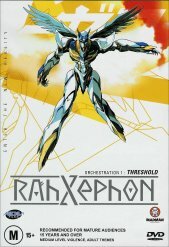 The quality of the drawing and animation is absolutely fantastic, keep an eye out for the scene when our hero first pilots Rah Xephon, the animation around the eyes of the creature when the pilot is looking around is fantastic I�ve never seen such great clarity, my commendations to the animators. Extras include the opening and closing scenes without all the writing, special Japanese trailer for Rah Xephon, production sketches and also ADV previews. The music for the action scenes rock it really gets you excited it really creates a great mood, the quality if the sound is also harmoniously clear. It would really be great if I could get my hands on the sound track, it could actually stand up by itself. The content would get a ten if the story wasn�t so hard to follow, the animation was triple A.